Almost flew into the side of a hill yesterday! It was touch & go and just as I was getting panicky because the hill was obviously higher than 400’ I completely lost connection and I couldn’t see it for a tree! RTH worked even though it was still trying to connect. It was worrying because on the air you always got a warning to adjust antennas but this just lost it without warning. I seem to remember a thread that explained about height restrictions and hills but I can’t find it? It might sound stupid but what are the rules about flying off the top of a hill again? Thanks Dave, That’s not the exact one, but very helpful. So I fly up to 400’ from the bottom of the hill and as ground level rises and the drone goes up the hill I can fly higher, until at the top of the hill (say the hill is 500’ high from where I’m standing) I’m actually at 900’? Do I have to be controlling it from the top of the hill? Does the aircraft work on atmospheric pressure + the datum (where I took off from) or does it calculate starting height from terrain maps? If I run down the road to sea level, initialise the controller and aircraft, then run back up the road to 100’ and take off, will it give me a max height warning at 300’? Maybe it will reset the home height at takeoff. Sorry this is really boring, it’s probably been covered already in the thread. I may also be very stupid. You can be standing anywhere … just need to set your height limit accordingly. Basically it sets its logic to 0ft at take-off and calculates barometrically (very accurate!) from there. Good conditions and reasons to have your proximity sensors on! That’s very interesting. I had thought that GPS height triangulation was in there somewhere. The difficulty is, if I’m flying up the side of a hill (as I was) and I come across a tree and my max height limit, I don’t know how much higher I can legally go because I don’t know what the new ground level is. Plus we often have Hercules flying here and they come out of nowhere! I know all about the accuracy of the barometric sensors. I do very precise pressure measurements at work using the change in capacitance across microphone diaphragms and we can easily measure 4" change in altitude. It’s most definitely in there … just not used for height above t/o. If you look at logs it does log GPS altitude … and used as estimated t/o altitude for the purposes of things like AirData …. but I have some where the initial GPS altitude has been so low that I have tracks that show me flying through hills, since for the 3D track height AirData uses barometric height from t/o added to initial GPS altitude … and hence everything thereafter is out by the same amount. But - for all the height above t/o - barometric. At home, here, I’ve seen GPS altitude vary between about 25m below sea-level and up to 100m above. It’s really nearer 15m above. That’s another thing to remember about Litchi. If the terrain data is available you can use it, obviously, to specify the WPs’ height above ground. But when you do, you’ll notice that it also displays heights above t/o … the ground beneath WP1. This is rather important - since the api/Mavic ONLY deal in heights above t/o. As I mentioned above, the MP has no terrain data. At the initiation of the Mission the Mavic flies to the first waypoint at its height above t/o. You can extrapolate the various consequences of taking off from somewhere much lower than the ground beneath that first WP …. which is why I always have the first one immediately above t/o. But on varying height terrain that is inaccurate. If you take of at the top of a 500ft vertical cliff … the Drone Code effectively prevents you flying over the edge at all … and that might only be 6ft away. Obviously … one has to work around extremes … but that kills the string logic. Take a look at the other thread linked to in the 2nd post of this thread. Indeed - that was in the thread I linked to in the 2nd post … but you still cannot be >400ft vertically agl, as I understand it. By which, I don’t believe this is legal … even if unlikely (in the UK, at least). 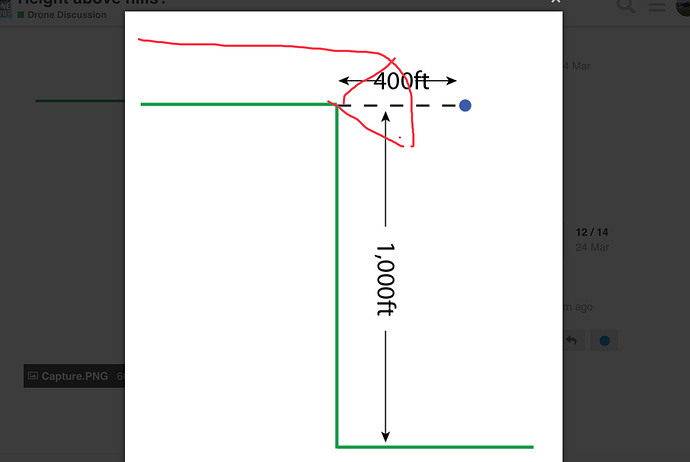 I exaggerate, to explain a point … but this isn’t 400ft agl (height) in any shape. From the wording I think that is legal. 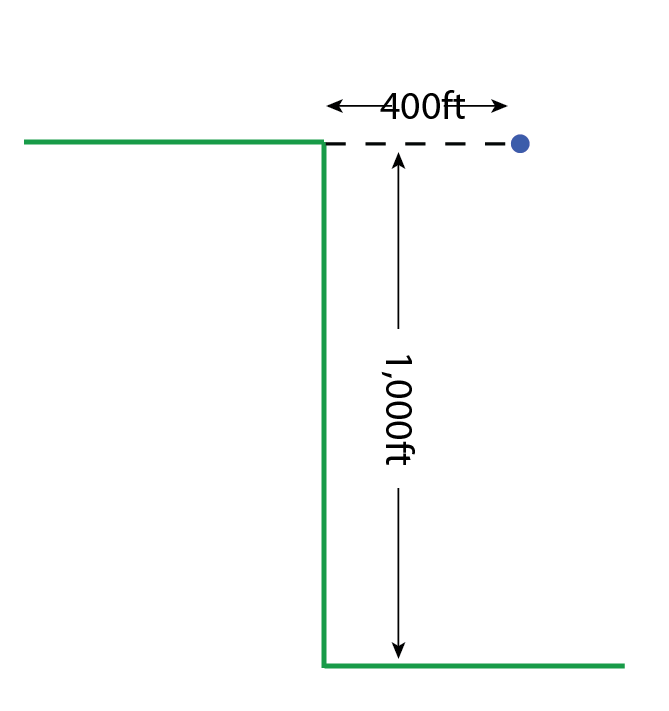 The interpretation is to remain 400ft distance from surface which you are doing in your example. I think “distance” is the key word. 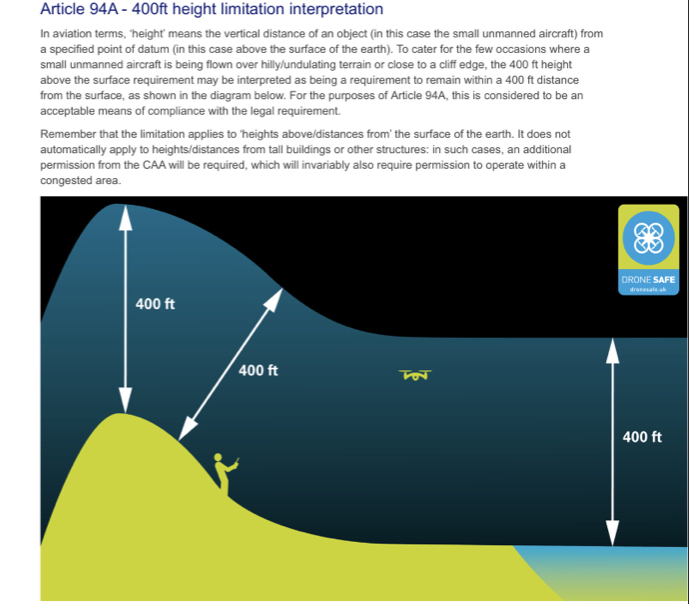 Callum, that was the understanding I had been given on the PfCO theory, that you had to be no more than 400ft from land that includes 400 ft from the top corner. Think I’ll drive down to Hangman Cliffs …. Just want to see them get there tape measures out! That CAA diagram is very poorly thought through! It should be perpendicular to ground or not at all, not following any curve! I’d say just be sensible and follow the spirit of it. In purely practical terms, if you were 10’ horizontally from the cliff and 1,000’ high there’s no way a real aircraft could hit you, even a helicopter. As you get further away it obviously would be more and more dangerous until 400’ away, as in your drawing, it would be a very real hazard to air traffic. So I agree, totally illegal. I believe in a court of law it would be all about what a “reasonable” man would do. What I really don’t understand is why, in the hill picture, the 400’ should be perpendicular to the surface and not vertically from any given point on the surface. It’s good that this kind of thing is discussed. … I don’t fly with a tape-measure dangling from my drone, either.